Ahoy me hearties! 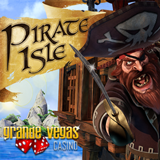 Grande Vegas Casino launched the new Realtime Gaming slot Pirate Isle today! Aaarrgh... and there's $125 casino bonus to celebrate. RTG also introduced a new mobile slot today and Grande Vegas has it in its mobile casino. Mermaid Queen has been popular online for awhile and now it's available for smart phones and tablets. Pirate Isle is a hilarious pirate-themed game with a fully-animated band of misfit pirates and two incredible bonus features. Three or more Treasure Chest symbols trigger the Treasure Chest feature where players select from spots on pirate’s map to reveal instant prizes. If they find a Treasure Chest with a lock matching one of the Treasure Keys they’ve collected along the way, their prize is tripled. Finding a Pirate Ghost ends the feature but awards up to 100 free spins. You can place an optional side bet in this game. If you do, and three or more Galleon symbols appear, the Broadside bonus feature begins. There you exchange broadsides with an enemy galleon, moving up a prize ladder when your canon-fire is successful. Reaching the top of the prize ladder wins the Pirate's Treasure Jackpot. The Labor Day freeroll slots tournament continues at Grande Vegas until the end of the month. Competing against other players on the popular Cleopatra’s Gold slot for $5000 in prize money.